I was hooked on the Sesame Salmon bites from Three Restaurant and Bar after the first visit. Those salmon bites are crispy on the outside and tender and juicy on the inside. They are so good that I hardly ever try any other items on their menu. This is my attempt to recreate the dish at home so that I can try other items the next time I visit Three. This turn out to be a really easy recipe and the result is really good! 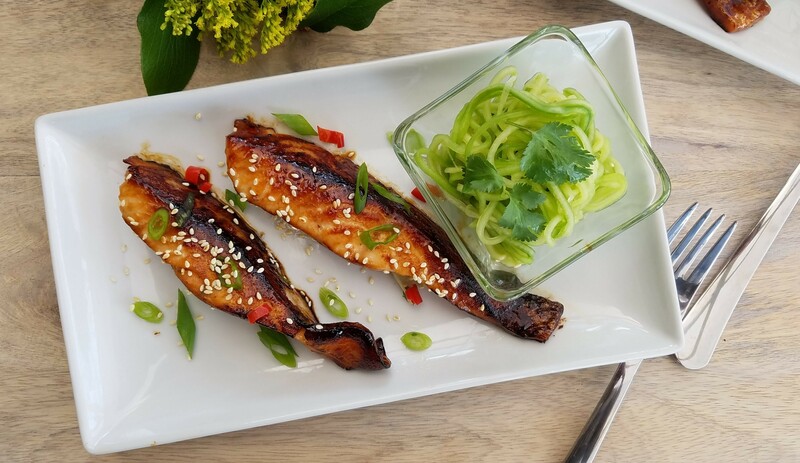 I made a big batch of Unagi sauce and it is so easy to fix a quick lunch and dinner any time I feel like having salmon bites. 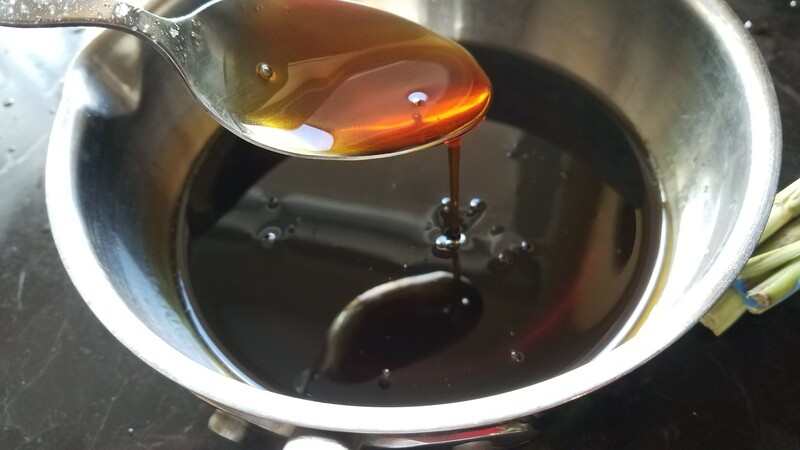 Combine the mirin and sake in a small sauce pan and bring it to a boil. Add the sugar and stir until the sugar is dissolved. Add the soy sauce and bring it to a boil. Reduce heat and simmer for 40 minutes until sauce thickens and coats the back of a spoon. Turn off heat and cool completely. 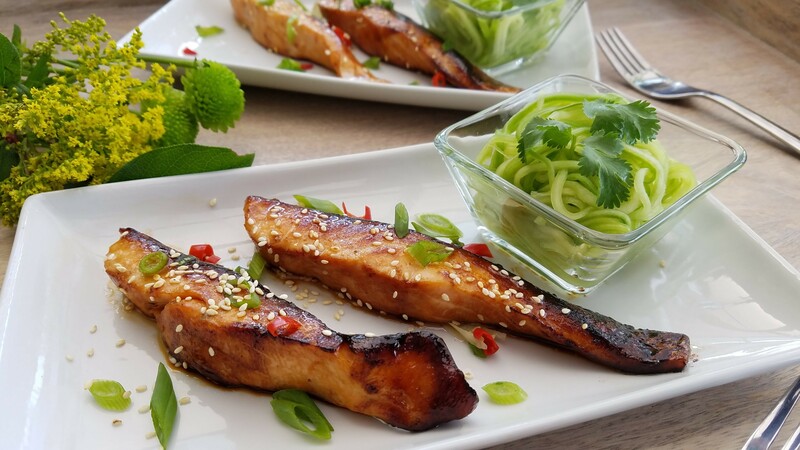 You will only use a small amount of sauce to marinade 1 lb of salmon. Store it in the refrigerator and use it to marinade other seafood or chicken. Peel the cucumber and shred the cucumber into long strips using a julienne peeler. Discard the core. Toss the shredded cucumber with the vinegar, sugar, water, salt, and sesame oil. Cut salmon into 1-inch slices or 1-inch cubes. Brush unagi sauce generously to coat the salmon pieces on all sides. Cover and refrigerate for at least an hour before cooking. Melt coconut oil in a skillet over medium high heat. Arrange the salmon slices or cubes in the skillet and sear for 2 minutes on one side. Do not flip the salmon during the 2 minutes so that it gets a chared, crispy crust on the pan side. Turn and cook the other sides of the salmon for another minute. Do not overcook the salmon or it will become tough and chewy. Transfer to serving dishes and garnish with green onions, chilli, and sesame seeds. Serve hot with chilled cucumber slaw.